This brick, arched footbridge was constructed by Sir John Baring, sometime after 1805, if the contemporary maps are accurate, to link Mount Radford House, his home, with St Leonards Church. At the same time as constructing the bridge, he also realigned Topsham Road, moving it forty feet away from the house, and making a cutting to ease the gradient, and hide the road from the house – the resultant kink in the road is still evident today. It is still possible to trace part of the buttress on the side of St Leonard's Church. It must have been a very dark place to walk at night for in 1895, a request was made to the Lighting Committee for a more powerful street light to be installed by the bridge. The Exeter and Plymouth Gazette reported on the 14th November 1931 that the bridge was to be taken down and the road widened. This was just after the trams had been discontinued and double-decker buses introduced into Exeter. Topsham-road Bridge to be Demolished. 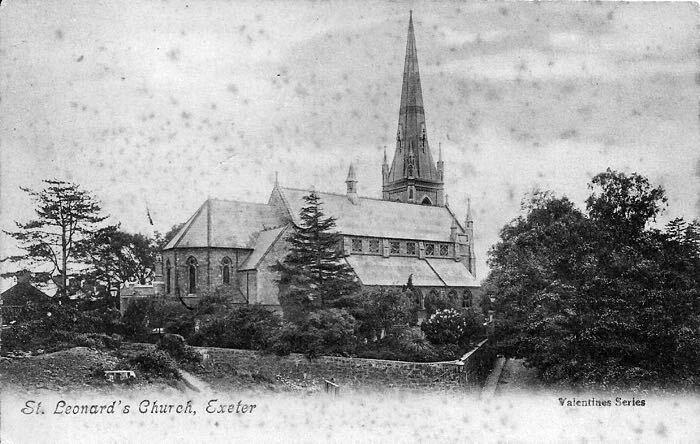 An interesting Exeter landmark will disappear to-morrow, when the brick bridge over Topsham-road by St. Leonard's Church will be taken down. It has hitherto precluded running double-decker buses to Burnthouse-lane, and has also made it impossible to deal with the awkward bend in the road at the spot. 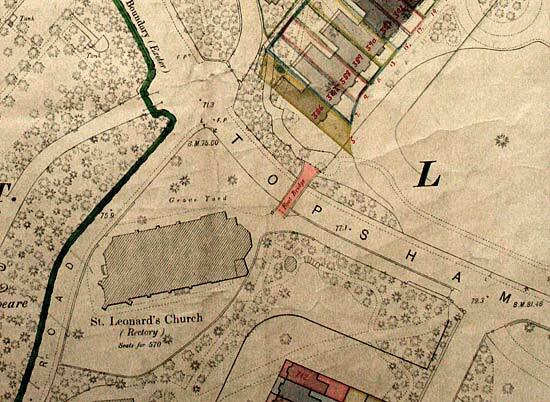 Traffic will be suspended from five to ten o'clock to-morrow morning and, during that time vehicles entering the city from the direction of Topsharn should turn into St. Leonard's-road. 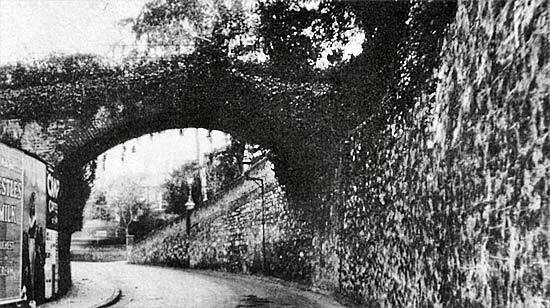 The bridge was built for the accommodation of the occupiers of Mount Radford House, which lay on the higher side the main road, its grounds extending from those of the old Larkbeare House from the city side to St. Leonard's-road. It was at one time used as a private school, and was afterwards occupied by the late Mr. E. Knapman. The bridge has been closed for many years, and amongst the last occasions which it was used was when Mr. Knapman's two daughters walked across it their weddings at St. Leonard's Church. Mount Radford House was demolished in 1902. The bridge is in the centre, tinted red. The Topsham Road footbridge that was adjacent to St Leonard's Church. The view shows the road towards Topsham. This view from the grounds of Mount Radford House shows the pedestrian way over the bridge just to the right of the church.